Justin McLeod says: "I have the linistepper working with EMC, I have attached a screen shot of the configuration page. All the values in the screen shot have a safety factor of 500ns. One note on the max step rate value, a large factor in that is the latency test result, due to real time, my latency number is really low, so the max frequency could be much lower for some people." I started my EMC2 config for Linistepper with these numbers and they do work just fine. A little research came up with no hard timing numbers for the Linisteper so I did a little experimenting to see what would happen. I took Step Time and Step Space down to 25ns without any problems. Direction hold and Setup isn't as critical so I took them to 50ns each to verify function. 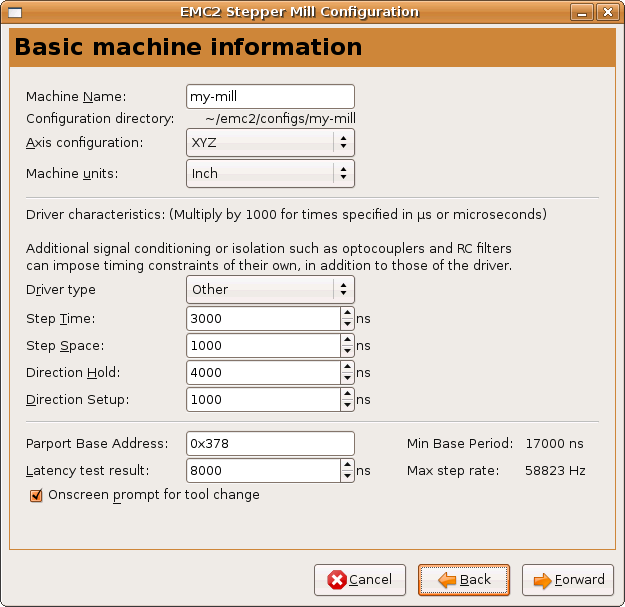 For some additional safety margin, I'm using 30, 30, 100, 100 for the 4 Linistepper values in EMC2 with 18th step mode. Faster numbers may be possible but with my Latency of 12,001 and small motors, these are about the limits of my hardware so I didn't bother with anything lower. The THB6064AH driver will catch a 2.3uS pulse.